Raspberry Gin Sorbet With Lavender Thins. Cool and refreshing, a cocktail in a dessert glass, or for a bit of fun why not freeze in ice lolly moulds for an adult only version. 1. To make the sorbet, add the sugar and water to a saucepan, heat gently, stirring from time to time until the sugar has dissolved then boil rapidly for 1 minute. Take off the heat and set aside. 2. Add the raspberries to a food processor or liquidiser and puree until smooth. Press through a sieve into a bowl and discard the seeds. Stir the gin and sugar syrup into the berry puree. 20 minutes until thick. Lightly fork the egg white together until frothy then beat into the sorbet and churn for 10 more minutes until thick enough to scoop. 4. Without an electric ice cream machine, pour the mixture into a shallow cake tin with a fixed base and freeze for 4 hours until semi frozen. Beat with a fork or blitz in a food processor until smooth and gradually beat in the lightly whipped egg white. Transfer to a plastic container, cover with a lid and freeze for 3-4 hours or overnight until firm. 5. To make the lavender thins, preheat the oven to 170°C, fan assisted 150°C, Gas mark 3. Add all the ingredients to a bowl and rub in the butter with fingertips or an electric mixer until the mixture resembles fine crumbs. Bring the crumbs together with your hands to make a dough then roll out thinly on a lightly floured surface. 6. Press into a 23cm (9 inch) diameter fluted flan tin. Prick the centre with a fork and press the edges with a fingertip. Sprinkle with a little extra sugar. Cook for 25-30 minutes until pale golden around the edges. Mark into 12 thin wedges, sprinkle with extra lavender petals and leave to cool. 7. To serve, scoop the sorbet into glasses and serve with lavender thins. If the sorbet has been in the freezer overnight then take the container out of the freezer and allow to soften for 10 minutes before scooping. Not a fan of lavender then leave it out and add the grated rind of ½ a lemon or leave the biscuit mix plain. 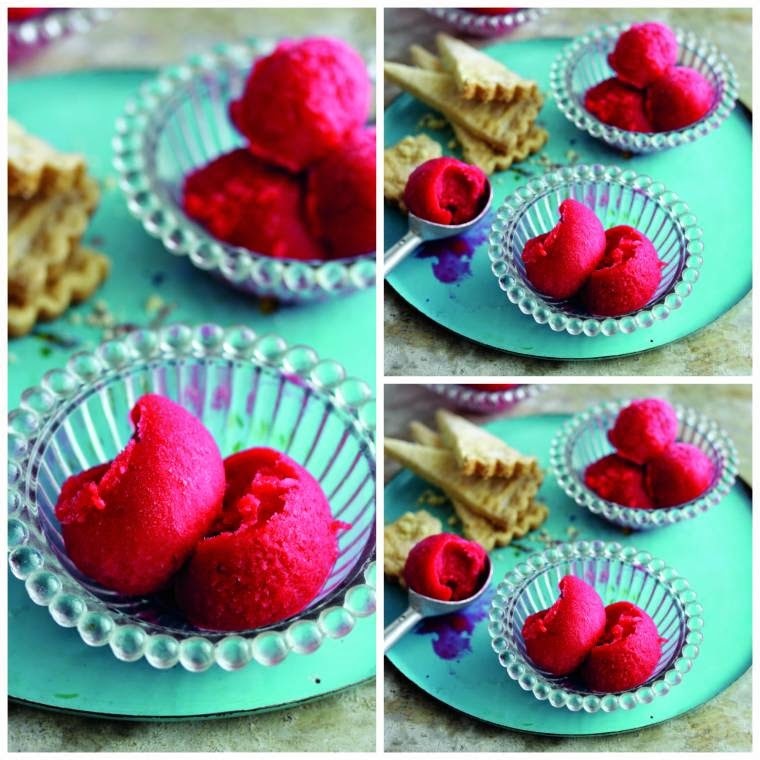 Raspberry Gin Sorbet With Lavender ThinsThis is a guest post from Seasonal Berries. No payment was received. You might also like: Strawberry and Elderflower Sorbet. "What Time Is It? Time For A Blog Hop.."